Thank you Matt, it was really fast! I just got my Fibaro Keyfob and am trying to sync it. I installed the above z-wave library but I am unable to sync the device unless I am doing something wrong. I now have a Basic Wall controller which I try to sync. Am I correct in pressing O and + for syncing? After doing that severtal times I get the message the device migt not be awake.... sync failed. Z-Wave Syncing - started for "126 - Basic Wall Controller"
Z-Wave Syncing - assigning return route to "126 - Basic Wall Controller"
Z-Wave Error Timeout waiting for "126 - Basic Wall Controller". Module might be asleep, or is unreachable. Z-Wave Syncing - started for "127 - Basic Wall Controller"
Z-Wave Syncing - assigning return route to "127 - Basic Wall Controller"
Z-Wave Syncing - created device "127 - Keyfob (FGKF601)"
SQL Logger creating table device_history_374652588 for "127 - Keyfob (FGKF601)"
I also have the same problem, used the button so much to try and get it to sync with encryption it now reads 34% battery left, so much for 2 years battery life. Then tried without encryption and it synced. I will hold off getting the second one out of the box and run the battery down until it is fully supported, hopefully in 7.0.4 as I need encryption as it is going to unlock the Yale front door Z-wave lock. Got the key fob working, however I can't get a double or triple click to work - it just detects multiple one clicks. Any ideas? well I still don't use it. After 3months there still is no update. No encryption. I will try and answer you question but it will take me a few days until I can get to it. The encryption problem isn't an Indigo one; you need to get the keyfob to stay awake or keep waking it. Encryption does take longer to sync which is why it's maybe going to sleep. Ah do you have one with encryption? I just could never get it to start doing the full sync with encryption. Be nice to be able to use all of the functions, not just 6 buttons though. Are you using native Indigo actions/triggers or my plugin? My plugin in debug mode will show you what it's seeing, both raw commands and decoded. Using native 'when receiving z-wave command' via Indigo with the updated Z-Wave library. 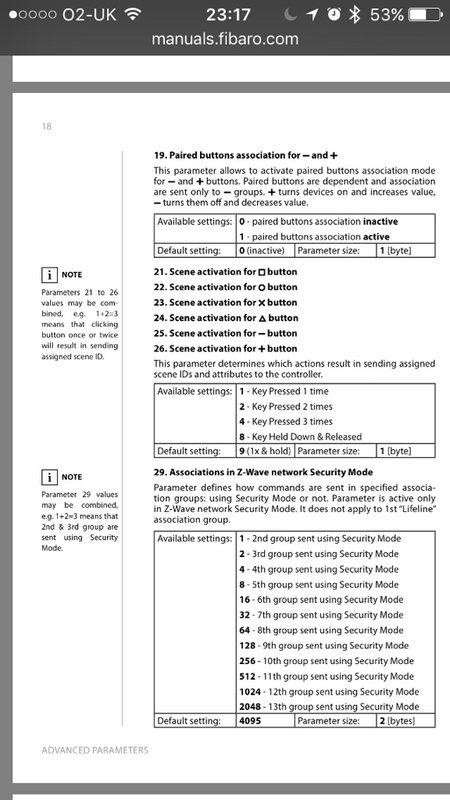 Parameters 21-26 control which multi-presses are sent. Default is value 9, which is Single presses plus Held. You need to set them to value 15 (i.e. 8+3+2+1) which is 1-3 clicks plus held. Multiple button presses are not enabled by default on the KeyFob, you must enable them with configuration parameters. Indigo 7.1.1 is now available for download and supports the Fibaro Keyfob (FGKF601).